The independent UK advertising body, Clearcast, banned the advert on the grounds of it being 'too political'. As December approaches, a large majority of national UK companies will be unveiling their Christmas adverts, typically competing with those released by John Lewis or Coca-Cola. One advert, however, has come under fire from the independent governing body for T.V. adverts, Clearcast, for being 'too political'. This advert was set to be broadcast by Iceland Foods, a U.K. food supermarket, in partnership with Greenpeace, a non-governmental environmental organization which aims to investigate, confront and expose environmental abuse. The advert was originally created by Greenpeace, however, all Greenpeace advertising was removed to allow for Iceland to broadcast it as apart of their annual Christmas campaign as well as their newly launched anti-palm oil campaign. Iceland has decided to battle the use of palm oil by removing it from their products. This is removal alongside this year's seasonal advert aims to raise awareness of the effects that palm oil has on rainforests and orangutan. It is illegal for political entities to broadcast advertisements on any form of media. 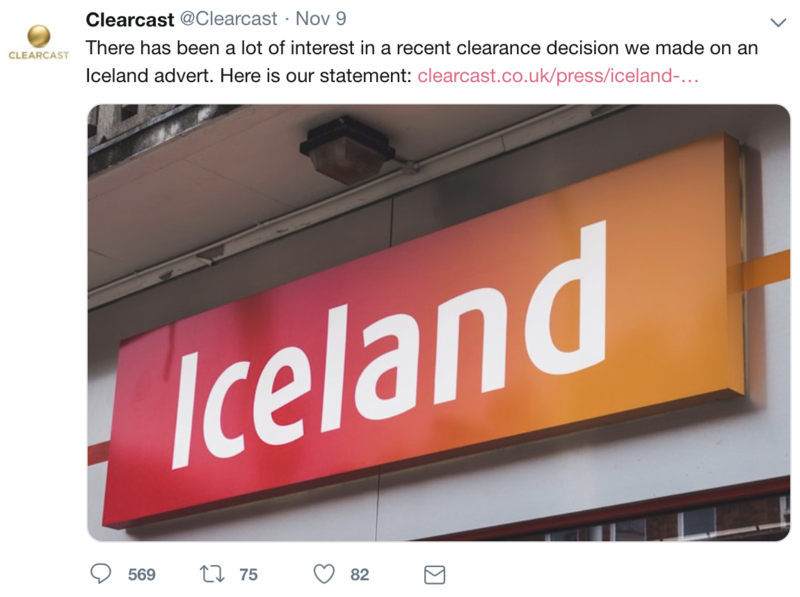 Clearcast banned the Iceland advert on the grounds that Greenpeace could be considered as a political entity, even though there is no branding or mention of Greenpeace in the Iceland advert. Although Clearcast does not have the direct authority to ban adverts from being broadcast, this responsibility lies with the Advertising Standards Authority and Ofcom, they can advise whether or not an advert may break British advertising laws. It is then up to commercial channels, such as ITV or Channel 4, to decide whether or not playing an advert will land them in legal trouble. Response to the Clearcast ban has been huge. The advert was aired on primetime TV during a ThisMorning broadcast, with Phillip Schofield stating that he felt it was "Right" for the advert to be aired. On social media, the advert has been watched 3 million times on the Iceland Youtube Channel, 13 million views on its Facebook page and over 90 thousand retweets on Twitter. There has also been a change.org petition launched in an attempt to get Clearcast to reverse its decision, currently sitting at over 700 thousand signatures. You can view the advert by clicking here. Do you think the banning of this advert was just? Are you a fan of the advert itself?